This week, Jonathan Denwood and Kim Shivler interviewed Chris Rogers of CraftYada.com. Chris is an actor and WordPress developer who is launching a business to teach people in the Entertainment Industry how to create WordPress websites in order to promote their careers. He has a niche market that he fully understands. As he explained, part of helping entertainers with their website includes helping them with Social Media. While many of us just think Facebook, Twitter, and maybe LinkedIn, Chris pointed out that for actors you need to have an IMDB profile and make sure you are in directories like Actors Access (http://www.actorsaccess.com/) and Casting Frontier (https://castingfrontier.com/). Chris also owns a digital media company that includes video production. He explained the importance of having high quality video on your website, and teaches people how to create clips and easily place them on their sites. While his media business is more established, the classes to help entertainers create websites are part of a new endeavor. He will be targeting entertainers who currently use a Facebook page as their sole website to help them create a true branded site. We look forward to having Chris back in the future to explore his progress. Kim: Hello everybody. Welcome to episode 246 of the WP-Tonic Podcast. 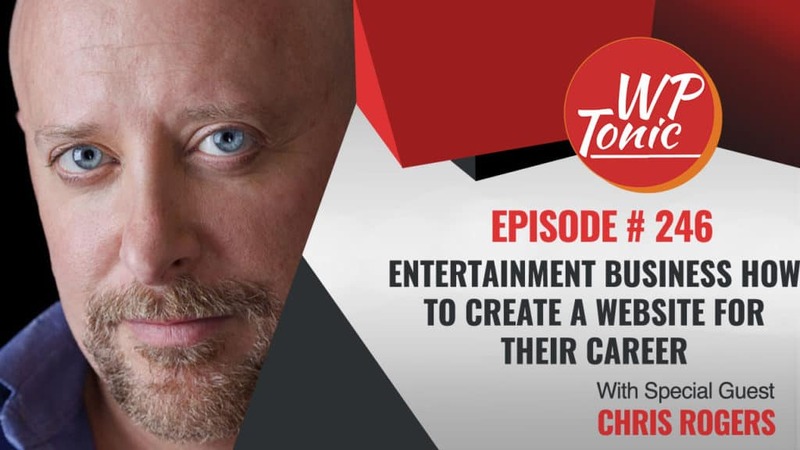 Today we are going to be talking to Chris Rogers about building your websites for your entertainment business career. He works with actors and other people in the Entertainment Industry on building sites to promote themselves. And this is going to be a great topic to discuss because it’s something new that we haven’t talked about before on WP-Tonic. I’m going to go ahead and give the team a chance to introduce themselves and then we’re going to jump right into it. Chris, tell us a little bit about yourself. Chris: Hi, good morning. Thank you so much for having me. I’m originally from real small town in Kentucky. And while I was pursuing my career in LA, I got the chance to go back to school and got a Degree in Multimedia from West LA College, which is right next to Sony Studios in Culver City. And when I first got out of school, I learned how to transfer all my skills as an actor, singer, dancer from in front of the camera to behind it. While I was there, well, I mean, when I first got out of school, that was when the Web was huge. Well, I mean, it still is. But I mean when it was really becoming huge, big. I did like a per project basis on most of the studios around LA. So I got a chance to see both sides of the camera. I got to work on both sides of the camera both as a performer and also as a Web Designer. And I saw where a lot of the problems where a lot of performers, where they tripped themselves up, where some things that are really important that they just kind of blow off that they don’t really learn in school, but you see where they are so vitally important when you’re on the other side of desk. Just stupid things like showing up on time, knowing your lines. It’s not rocket science. But they don’t really stress that as much when you’re in Acting school. So this is my attempt at showing people, everyone knows that they need a website for their career. But they’re either intimidated by the technology or they don’t want to take the time to learn it or whatever. And so, I’m showing them the path of least resistance, the keep it simple stupid approach to building a website. This is not rocket science. We’re not solving world hunger here. We’re just doing a basic informational website that’s got a couple pictures up there, a resume, some video clips and a way to contact them. If Steven Spielberg is walking through the Web and then decides, “Hey. I need an actor. I need a cop for my next Tom Cruise movie”, or something. Kim: Excellent. Thank you. And we are going to come back and dig into each of those pieces and what it means for them as we come back. Jonathan, would you please introduce yourself? Jonathan: Thanks, Kim. I’m the founder of WP-Tonic. We’re a support maintenance company, specializing only in WordPress. We have a specialty with Learning Management Systems. We’re really into that. And before I pass it over back to Kim, I’d like to quickly talk about our sponsor for the show today and that’s IntelligenceWP. And what is that? It’s an amazing plugin that helps you with Google Analytics. Yes, I know, either if you’re doing a site for yourself or for a client, you set up Google Analytics and then you probably, yourself or the client, never goes back to Google Analytics. Where this helps, it gives a fantastic backend interface. It gives an amazing amount of in-depth information and guidance. And backing it are the founders. 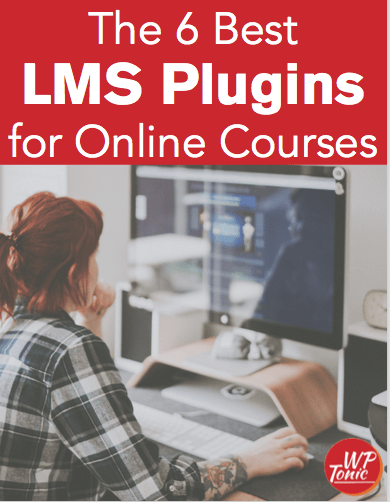 They will give you free training and support to get the most out of this amazing plugin. To find more, go to the WP-Tonic website. I’ve got it on the WP-Tonic website myself and it’s amazing. Back to you Kim. Kim: Thank you, Jonathan. And I’m Kim Shivler. I’m a Communications and Technology Instructor and also the co-host now of WP-Tonic. Let’s jump into, I’d like to start really talking about the website for the Entertain Industry. Then talk about some of the choices you made with as you decided to build out an online learning platform around this Chris. And then, also, I think one of the things that’s going to come up through our thread today is how important video is. You’ve already kind of hinted to that as far as helping people with video and it’s just getting bigger and bigger and bigger as we go forward. So I think that will be something we do touch on. So from an entertainer’s perspective, when you’re working with people and you are giving them not just the technical how to, but the strategy of what they specifically need on their website. Are there any specific things that like niche wise are different for them or are there super checklist items that they have to make sure of that maybe you wouldn’t think of if you were working with a restaurant, for example or another type of business? Chris: Sure. Well, first of all, I have to thank you and to let the audience know that this whole idea came from an inspiring WordCamp presentation that you gave at WordCamp Las Vegas in like 2015 or so, where you talked about the different Learning Management Systems and the options that are out there and membership sites and things like that. I’d never met you before in my life and you just gave a, I just thought a fantastic talk. I think it was a matter of me being at the right place at the right time in my path of WordPress learning as far as being ready to hear what I needed to hear. So I’m a big believer in the WordCamp system and learning from other people that know more than you. If you’re the smartest person in the room, you need to get up and get into a different room. So, the question about the differences between video, as far as, I think with my thing that everybody in the business knows they need a website. But they’re either intimidated by the technology or they don’t want to take the time to learn it. What I found was that with a lot of the training that I would find, and there’s some great stuff on YouTube, is that they make it so generic that it’s so broad that they talk about so much that doesn’t have any real world, practical implications to what I’m trying to do as a performer. And also, the website is not just for performers. Although I anticipate probably 80 percent will be or a costume designer or a gaffer. Anybody that works in Entertainment business that they could take this class and learn how to create a website for no matter what their profession is. But I do anticipate that 80 percent probably will be actors, is my guess. I’m interested in getting the analytics for that. Hopefully, like within the next couple days or so, I want to have the website to be looked over by my Web Designer. I did all the content, but I had to get someone that is way more uber computer geek than I am in order to do all the supercomputer stuff, the super WordPress heavy stuff to help me with that. So making it more specific instead of talking about your audience saying when a potential Casting Director is looking at your website. So you can’t really do monetization on it. That would be tacky. People do it, but it’s not very business friendly. Making sure that you have an IMDB presence because that is the industry standard for everything in the business as far as detailed information about your project or you as an actor or whatever. Like with social media, yes Facebook and Twitter and Instagram. Yeah. They’re huge. But there’s more of an emphasis on like your casting profiles, like on Actors Access or Casting Frontier or whatever. In fact, I’ll probably write a plugin that’s specifically for the business. Just like how you have a social media plugin for Facebook, Instagram, Twitter, I’ll probably do one for IMDB and Actors Access and all the different profiles that as an Entertainment business, you have a profile up there. Kim: Nice. Okay. So there are very specific things then, as far as entertainers, that are going to be very different than just a generic WordPress. From a content perspective, I just picked up on something. This was not in my list of questions that I already had. But I pick on it as you were saying it. As opposed to writing to, a lot of times what we’re thinking of is our business audience. You might be writing specifically to a Casting Director or that type of person. Are there any keys to copywriting that you would tweak or help them tweak for that through your course? Chris: Sure. So the basic class, that should be launching in the next couple of days, we just go over the generalities of, this is how you get a blog working. I don’t talk about, in the specifics in this class. But I do in the future will have a specific class for social media and blogging. You don’t want to say anything negative. It’s okay to have an opinion. I love Cate Blanchett. I doubt I would ever say anything against her because she’s just a fantastic actress. But there are other actors that sometimes they’re good, sometimes they’re bad. Like my reviews, I always post reviews for the SAG Award movies. Those will be coming out like the next couple weeks or so. And unfortunately, there is, and it’s a valid opinion that you don’t want to say anything negative about a movie. But then, how do you review a movie without, you’ve got to say the positive and the negative. So I always try to do it from a positive perspective and say why this movie was so great. And then instead of saying like, “Oh, this guy sucked. How did he ever get cast?”, I would say something like, “I’ve seen him better in other movies such as A, B, C, D”. Unfortunately, that does come back to bite you in the behind. Trying to make this PC here. Casting Directors and Agents, they do go back and look at your social media profile. I’ve seen many people post in the Actor Facebook groups that I belong to that when they’re being interviewed for an Agency to make sure there’s no drunken horror pictures on their profile or saying something like, “I just worked with Amy Adams and she came to set drunk every day here”. Something crazy, stupid like that. People do that because they’re actors. They don’t think about the long-term implications of what they’re saying. You could write it today. But then, two years from now, you are interviewing at the same Agency that Amy Adams is at and they would go back and they find that and they think, “Why would I ever want to represent an actor that would say something about someone as fabulously talented as Amy Adams”. So that’s a very real thing. You have to tread that fine line between being honest and being an idiot. Kim: And then, I know this is something that has happened to me because I’m a trainer and a strategist and I don’t actually provide services anymore. Do you actually provide built for or done for you services? Or if not, do you have someone you’ve partnered with that you can send people to? Because some people just don’t want to build their own site. They want people to at least get the structure for them and then they could possibly blog or something else. Chris: Sure. I’m sorry. To go back to that previous point about never saying anything bad. But, see, that’s also part of the acting process is that you have to have a coach or a director or somebody that you trust because your acting is not always great. In fact, it’s often bad. And you need someone that you trust to say, “Hey. This is not good. I didn’t believe you when were yelling at this person. That does not look like real life behavior”. So you do need to learn when you’re not good. It’s kind of the opposite of the acting process. I’m known for being an honest person. I try to live with integrity. And if someone is not good, but you have to tell them in a constructive criticism kind of way, in a positive constructive criticism kind of way. So I didn’t mean that you can never say anything bad. I just mean that you have to put it in a constructive way so that they can learn from it, not to make yourself feel better about putting somebody down because of their acting or whatever. Anyway. I’m sorry. So you were saying, the question was about, who have I worked with? Kim: Well, no. It’s actually, you’re teaching now. You’re teaching the entertainers how to do this. What is your process for when someone approaches you and says, “I don’t want to learn to do it. I want someone to do it for me”. Do you offer those services? Or if not, do you have someone you’ve partnered with who can offer those services to build the site out for them? Chris: Yes. I will, in the future, do, first of all, I would do it for them, if that’s an option they want and they don’t want to know. Because I do anticipate doing that for other people because they’re so busy auditioning and running away to Europe to shoot the next Tom Cruise movie or something like that. I’m hoping that, I mean, not hoping, but I’m anticipating that there are working actors that just don’t have the time to do it. And so, because I put so much time in it, I know where all the pitfalls are, where the common problems are. So WP Engine, which is my hosting company, they have a great platform where you can do like a generic version of a site. And then, you can export that site and someone can then import that into their hosting platform and upload the photos and resume and all that jazz. Or I can use that as a starting point to develop generic placeholders, just placeholders of photos and placeholders for video and things like that. And then, I plug in the individual person’s information. That’s another service that I will offer. Chris: So then, all they would do going forward if they want to, is doing a blog. Like talking about their audition for 42nd Street or whatever, so that every day they write something constructive, positive about their career, not, “I went to Starbucks and got a bagel today”. I don’t want to read that crap. And Casting Directors don’t want to read that crap either. Kim: Put that on Facebook. Chris: But, if you bumped into Cate Blanchett, that would be something worth talking about. Chris: And give her my phone number. Kim: Yes. That would be, absolutely. Thank you for the shoutout to me. Yes. We met at that WordCamp and I was speaking about online courses. And I believe that you selected to use Sensei to deliver your training. Is that correct? Jonathan: But before that Kim, before Chris answers that, we need to go for our break folks. And we’ll be back and Chris can answer that fascinating question in a few moments folks. We’ll be back in a few moments. Jonathan: We’re coming back. We’ve had a great conversation with Chris. Hollywood meets WordPress. So, go for it, Kim. Get your question answered. Kim: So, yes. I remembered that you had selected Sensei to use for your LMS and I was wondering what made you choose that? Were you already a WooCommerce shop, that type of thing. Chris: Well, there could have been easier solutions like maybe Digital Downloads or there’s a couple of the other ones. But I chose Sensei because one of the other guys that runs a WooCommerce meetup here in Las Vegas, Michael. He knows Sensei very well and I know him personally. So I figured if I had a problem, I could pick up the phone and call him immediately because he knows Sensei very well. And I also rationalized that it’s part of the WooCommerce, I’m sorry, the Automattic family. So Automattic owns Woo and it also owns Sensei. So they are guaranteed to play well together in the sandbox. So that’s another part of my approach to WordPress is that you try to keep it in the family. So like I’m a big proponent of Jetpack. That’s a Swiss Army knife. It’s one plugin that does so many different things well and it’s by the Automattic family. So I figured that all of those things are going to play well together and they’re going to be supported well together. And I also thought that another company could hire me to do their Learning System and Sensei is a huge, there’s so many robust options to it. So I rationalized, even though Sensei could be overkill for my immediate needs, I could see being hired by company to develop their training. And in fact, I do have a food and beverage company here in Las Vegas that has approached me about it. But I haven’t heard back to be a trainer for them to teach how to do their approach to all of their paperwork and their onboarding process. So that’s still a possibility. But I haven’t heard back from them in a month or two so I’m guessing that they went on to somebody else. But that’s how I rationalized choosing Sensei over any of the other learning platforms. Kim: That actually makes a lot of sense. I would still circle back to them. I like follow up. When I hear you say, “Well, I haven’t heard from them in a couple of months”. That’s when you pick up the phone and you call them. All right. I will get down off of my business coaching soapbox. When you built that first course and then I need to hand this over to Jonathan. I know he’s got some questions. But when you build that first course, as you know, I’m an Education strategist also. That’s actually more my strength than technology even. Were there any challenges you ran into that kind of surprised you? Like you, “You know that piece was a little harder than I thought it was going to be”. Whether it was the technology or something else. Chris: I would say probably if I had to do this all over again that it’s a time management issue. I’m surprised that it’s taking me this long to get all of this done. Even though I know the subject very well, but it’s like life gets in the way. You’ve got to work. You’ve got to make money. It’s your kid’s birthday. All of these time issues take precedence and it’s so easy to blow it off saying, “Oh, well, I’ll get back to it. I’ll get back to my training tomorrow”. That would probably be one of the things that I was surprised the most about. But also, because I’ve already done it once, now I can see where the pitfalls are, where the time sucking things are and how to plan when I do my next class, which will probably either be the Social Media class or the Video and Graphics class, that I will apply all those things that I’ve learned. Kim: Excellent. Jonathan, let me hand it over to you. Jonathan: Thanks, Kim. So Chris, what’s the competition like in this area? I would imagine totally hosted solutions. Are there any other players doing something similar than what you’re proposing? Chris: Well, the problem is that no one is specifically Entertainment oriented. That’s what I’ve chosen as my vertical niche. I do anticipate, in fact, just a week or so ago, I’ve had so many people say, “You know, you should handle the hosting because that’s really so uber computer geek that it stresses people out”. So I’ll probably offer that like, “Let me handle the hosting issues for you”. But as far as other competitors, because when you call up and have a problem and like, “Why is this not working with the website?”, or whatever, they’re dealing with everybody, every website and whatever business niche that they’re in. Jonathan: Yeah. Well, I was thinking more and I might be totally wrong here Chris, but are there not kind of websites that have sections for specific actors that you can do searches on particular characters or type of characters and you can do search and find certain groups of actors and look at their profiles. Aren’t there a few websites like that? Chris: Not so much websites, but there’s like profiles like IMDB, Internet Movie Database. I think that’s kind of what you mean. Chris: But then, there are other industry specific profiles. I guess like Actors Access where every actor has a profile up there and you have your video clips but it’s contained. You can’t, as an actor, come in and look at Amy Adam’s profile. I can’t do that. Casting Directors can and Directors but the individual actor can’t. Chris: They wouldn’t be able to really learn or see other clips or the resume or anything like that. They wouldn’t be able to see those kind of profiles. Jonathan: Yeah. So I think what you’re saying is that they’re out there but they’re quite locked down in feature set. Is that what you’re saying? Chris: Yeah. And it’s written for those sites or programs for Casting Directors and for Directors who have to log in and get permission to use the process. But just a normal, us mere normal actors, we don’t get access to that. Jonathan: So do you propose like to have kind of different sections, sections like Invite Only, where the actor could invite people, access to and then have a more public facing side of their website? Chris: Yes. I do anticipate putting a membership site aspect to the training site. So it would kind of be like an actor could upload their headshot and then everybody in the, and say, “Hey. What do you guys think about this new headshot?”. And then people would give some feedback to it. Or, “What do you think about this new demo reel? Do you like if the reel is 3 minutes long and there’s like 4 different scenes on there? Do you think I should put the first one where I’m on Bosh? Should I put that in the middle or should that go at the end?”. So getting some kind of very specific industry feedback. Yeah. That’s where I plant to head in that direction like in the next 6 months or so. Jonathan: So, to kind of recap, because I was following the conversation with Kim. The reason why we had Chris on folks is that we thought it’s a fascinating insight about somebody who’s planning, who’s got really a lot of experience in their particular industry, that’s got into the WordPress community and is looking to do something that’s, I feel pretty interesting. And how they’re trying to get all these different parts together into a coherent strategy like dealing with the technology, WordPress plus all the business. And we thought it would a great insight to you the listener. So, when I was listening when Kim was talking to you Chris, there’s going to be various elements to your platform. You’re using WordPress as the key technology. But it’s a platform, isn’t it, really that you’re envisioning to develop. And it’s got the website element, but also, you’re going to provide a lot of training. Because what I think you’re saying is, yes, we get the website up, but they don’t actually know what that really means to get effective results. I’m on the right track there? Chris: Sure. Because people, actors, they’re not computer geeks like you and me. They don’t think about the broad picture. And I try to tell them how you would use this website. So I usually describe it as a hub that you upload your picture, your resume, some video and all that. So it’s all up there in this hub for you. And then, you blast that central image out to your Casting Director, your Agent, friends and family, your followers, things like that. And it’s not something just kind of hodgepodge put together. But it’s something that you’re actually proud of and that you want to send people. Because so many people are like, “Oh, yeah. I’ve got a website, but it’s not very good”. And so, I want to put together something that they are not just kind of okay with, but they’re proud of and take ownership of to blast out to everybody. Jonathan: So, do you envision also offering, because you just said that it would have a membership section. I think that was a little bit to the thing I was talking about where you have specific sections that are protected within the owner of that particular website could make public so only certain people can view it. The membership site, are you envisioning then that, not only do you build the website out for your client base, but you also offer a continuous education as a membership set up where you’re continuingly giving up information about how to these actors should market themselves online. Chris: That is another way of looking at it. I had originally thought that there would be like 6 or 7 different classes that people could log in and take like online classes like a track on Video and Graphics. Like, say you did a movie with Tom Cruise, now how do you get that clip on to the website? Or a Social Media class, how to set up the different profiles for you as an actor and then, or a blog. How do you blog? How do you write articles? How do you optimize it using Yoast? Things like that. There’s like 5 or 6 different classes that I had anticipated doing them like $99 for the whole class for like access for maybe a year is what I was thinking. But the other option would be doing it like on a monthly basis and have access to everything for like $5 or $10 a month or so. That is another way of looking at it. I’m not sure which is the right direction to go yet. But that will take quite a bit of time to develop all of that content. So I probably would do the pay for it and then you get access to it for like a year because I can concentrate on that. And then, I also have to update the other classes, like the basic class, the basic WordPress class. I’ll have to update that or I should after January when the new WordPress comes out and possibly the new theme, the Twenty Seventeen or 17, 20, Twenty Eighteen theme comes out. Jonathan: Yeah. So I think we’re going to wrap it up for the Podcast folks. But if Chris is up for it, we’ll probably do a kind of mind dump in the bonus content and I’ll put some ideas to Chris, things that you might not have considered. Well, hopefully, if he’s up for that, have a really good conversation. Chris: Sure. I would be glad to talk more about myself. Jonathan: Yeah. So, you’ll be able to see that folks on the WP-Tonic website and on our YouTube channel. Before we go, I’m going to let Chris, Chris, how do people get hold of you and learn more about what you’re up to? Chris: Sure. The website is craftyada.com. That’s craft like you and then the tagline is “You’ve got the Craft – We give you the Yada”. So the idea is that you learned in College or Trade school or whatever how to do your craft, but no one teaches you how to get a job. So this is all of the tools that you need to apply to the Directors or Casting Directors or Unions or whatever. And that’s craftyada.com. And then, if you want to hire me to be in your next movie, my actor profile is chrisrogerstheactor.com. And then, my just basic video production company is chrmedia.com. Those are my initials Chris Roger, chrmedia.com. Jonathan: That’s great. And Kim, how do people learn more about you Kim? Kim: You can find me on Twitter @kimshivler or find me online at kimshivler.com. Jonathan: Oh, that’s great. And if you want to find more about WP-Tonic, that’s the WP-Tonic website, you’ll find all our interviews on there. We have a full transcription of what was said. We’re also in the near future going to be starting a Facebook group and hopefully, we’ll be able to give you details about that soon and you’ll be able to join us in some great discussions on there. Or you can twitter @jonathandenwood. And if you’re really feeling generous, if you could give us a review on iTunes. That really does help the show. We’ve had some good reviews lately and it’s much appreciated. And we’ll see you next week where we’re going to be interviewing somebody doing something interesting with WordPress. We’ll see you next week folks. Bye.